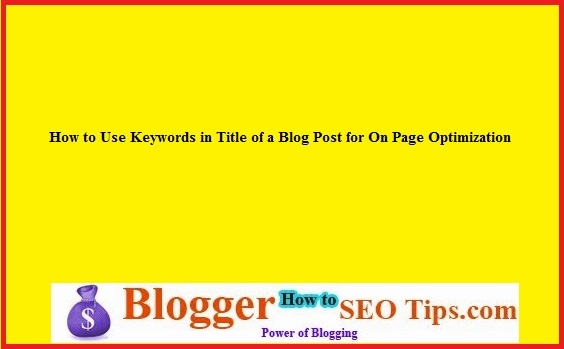 Keywords are keys for getting organic traffic, organic traffic means traffic from search engines, if you have read my blog post about basic SEO tips from Google then probably you know, how blog post title is important to get your blog post on the search engine result pages, may be on the top of the result pages for a query. You can also get your blog post on the top of the search engine result pages but to make it happen for your blog post, you need to write a lengthy blog post at least have 1200 words then only your blog post is going to stand on niche like blogging tips, SEO Tips, make money online tips. Probably you are thinking, why for these niches? The answer is quiet simple, these niches having maximum number of queries in the world, alone make money online having almost 300,000 per month worldwide queries, then definitely there are many bloggers, webmasters or may be website owners are writing a blog post on this topic, then the next question is that who's blog post will be on top, the answer is simple, whose blog post is lengthy with quality means people are reading the post to full fill their purpose and they got that much staff from the article, which search engine come to know from time spend by reader on the blog, but lengthy article does not mean you will write anything, then again it will be wastage of time nothing else, write everything about the blog post title to make it more useful for your blog readers, get that! Now straight come to the main point of this blog post, how would you use keywords in your blog post title to drive more traffic from search engine, probably you wanted to know about that, that's why you are reading this blog post till now! Here is the answer for you, use important keywords first then use other none important keywords, probably this is not that much clear for you, that's why lets take an example regarding this to make it clear for you. So, here is the example for you, I have written a blog post about SEO tips for blog, so I have decided to give title name of the blog post is "Top 11 Best SEO Tips for Beginner Bloggers"
Here are things to know for you, I have given first keyword is TOP, which is important people search TOP SEO TIPs like these keywords, people rarely search SEO Top right, so I have strat keyword TOP then 11 which is seems odd but effective till now for this blog post, this blog post still on the top of the search engine result pages, when people search "Top SEO Tips for Beginner Bloggers", or probably "Top SEO Tips for Bloggers", so I have used keywords in the title of the blog post according to keywords are important for people for searching on the search engines. Well, using keywords is really important, but overwhelming is really worst I don't know why people try hard for this, the main reason is that they wanted to get success overnight and that's not possible at least in blogging. Try to write details articles and never copied from any one not even an idea to make your blog unique. I hope this concept about SEO is clear for you, but remember write a blog post, what is unique, which is discovered by you, not by others, do lots of experiments set a small target and achieve it, because ultimately which will lead you to achieve the big target. Title appear on search result page also it is one of the crucial factor that determine ranking of your website on search engine. Having impressive title on page of your website can also improve CTR of your website.